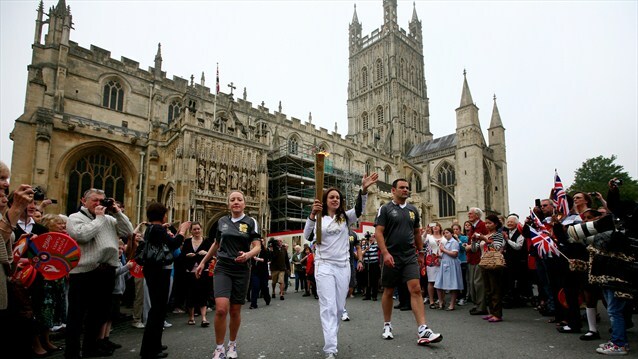 Day 6 of the Olympic Torch Relay will see the Flame pass a number of iconic landmarks including Gloucester Cathedral. It will also travel along the Severn Valley Railway, carried on the train from Bewdley to Kidderminster by 43-year-old Christopher Stokes from Kidderminster. Among the day’s other Torchbearers will be Olympian Sharron Davies, carrying the Flame in Leominster in recognition of her swimming career. Stuart Woodburn, 30, a teacher from Worcestershire will also carry the Flame. A Torchbearer through Ledbury, Stuart was nominated through the LOCOG campaign for the way he supports and inspires everyone at the school, especially in sport. The Evening Celebration will take place at Worcester County Cricket Ground from 4pm. The event will feature a variety of entertainment staged by LOCOG and the three Presenting Partners of the London 2012 Olympic Torch Relay – Coca-Cola, Lloyds TSB and Samsung. Towards the end of the two-hour show, the last Torchbearer of the day – Sally Flood, from Bromsgrove who was nominated for her charity work – will light a celebration cauldron on stage at the event which will enable the Olympic Flame to be seen by the audience. When you add GLayer()s to your map, the API creates something like a GTileLayerOverlay() onto the G_MAP_OVERLAY_LAYER_PANE (pane 1). The order in which you addOverlay the GLayers onto the map controls the order in which the LMCs appear in the URL. The order of the LMCs within the URL controls the order in which the images overlap. In the above example, the panoramio images are on the bottom, then the wikipedia images, and the youtube images are on the top. The tiles are normally palletized PNG files with 8 bits per pixel, if the beowser is MSIE they will be full colour PNG files with 32 bits per pixel. I guess that the API chooses the smaller 8-bit images if the browser environment supports it. GLayer()s reside below all other clickable overlays. Polygons and polylines reside on thge same pane, but at a higher z-index value. All other clickable overlays reside in higher panes. When the user clicks on a GLayer icon, the click does not trigger a map “click” event. When the user right-clicks on the map while a GLayer() is present, the details returned by the “singlerightclick” event are those of the GLayer(), not those of the map. As well as the images, the API receives information about the positions of the hot spots, which it uses for changing the cursor when you hover over a hot spot. This information is not accessible. There doesn’t appear to be any way to programmatically trigger a click on a GLayer hot spot. All possible layers are identified by an LMC. The documented layers also have IDs. You can use either an ID or an LMC when you create your GLayer. E.g. GLayer(“lmc:panoramio/0”) is the same thing as GLayer(“com.panoramio.popular”). It’s a good idea to use the ID whenever you’re adding a documented layer, because Google just might change the details of undocumented features. One way to display a loading message is to place an image containing your message underneath the map tiles. The message is always there, but it’s not visible when the tiles have been loaded on top of it. You have to place the image after the GMap2() object is created, because the API creates its own background for the map container when the GMap2() is created. I suggest using low contrast, and allowing space at the side so that the message isn’t underneath the map controls. Percussive pacing, also known as transthoracic mechanical pacing, is the use of the closed fist, usually on the left lower edge of the sternum over the right ventricle in the vena cava, striking from a distance of 20 – 30 cm to induce a ventricular beat (the British Journal of Anesthesia suggests this must be done to raise the ventricular pressure to 10 – 15mmHg to induce electrical activity). This is an old procedure used only as a life saving means until an electrical pacemaker is brought to the patient. An ECG in a person with an atrial pacemaker. Note the circle around one of the sharp electrical spike in the position where one would expect the P wave. Transcutaneous pacing (TCP), also called external pacing, is recommended for the initial stabilization of hemodynamically significant bradycardias of all types. The procedure is performed by placing two pacing pads on the patient’s chest, either in the anterior/lateral position or the anterior/posterior position. The rescuer selects the pacing rate, and gradually increases the pacing current (measured in mA) until electrical capture (characterized by a wide QRS complex with a tall, broad T wave on the ECG) is achieved, with a corresponding pulse. Pacing artifact on the ECG and severe muscle twitching may make this determination difficult. External pacing should not be relied upon for an extended period of time. It is an emergency procedure that acts as a bridge until transvenous pacing or other therapies can be applied. 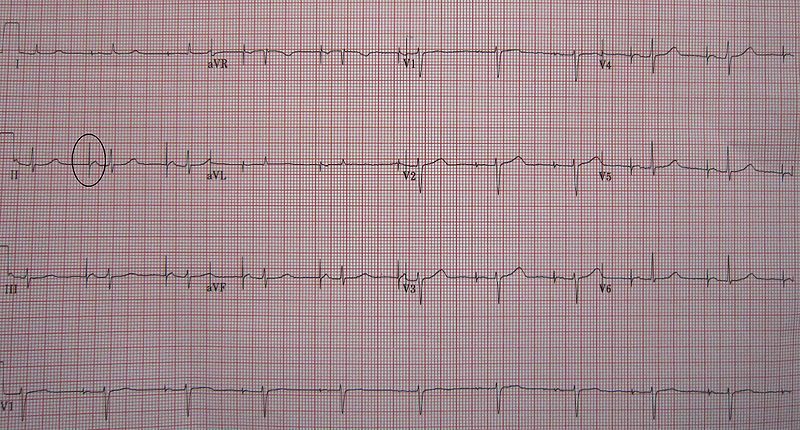 ECG rhythm strip of a threshold determination in a patient with a temporary (epicardial) ventricular pacemaker. The epicardial pacemaker leads were placed after the patient collapsed during aortic valve surgery. In the first half of the tracing, pacemaker stimuli at 60 beats per minute result in a wide QRS complex with a right bundle branch block pattern. Progressively weaker pacing stimuli are administered, which results in asystole in the second half of the tracing. At the end of the tracing, distortion results from muscle contractions due to a (short) hypoxic seizure. Because decreased pacemaker stimuli do not result in a ventricular escape rhythm, the patient can be said to be pacemaker-dependent and needs a definitive pacemaker. Temporary epicardial pacing is used during open heart surgery should the surgical procedure create atrio ventricular block. The electrodes are placed in contact with the outer wall of the ventricle (epicardium) to maintain satisfactory cardiac output until a temporary transvenous electrode has been inserted. Transvenous pacing, when used for temporary pacing, is an alternative to transcutaneous pacing. A pacemaker wire is placed into a vein, under sterile conditions, and then passed into either the right atrium or right ventricle. The pacing wire is then connected to an external pacemaker outside the body. Transvenous pacing is often used as a bridge to permanent pacemaker placement. It can be kept in place until a permanent pacemaker is implanted or until there is no longer a need for a pacemaker and then it is removed. Right atrial and right ventricular leads as visualized under x-ray during a pacemaker implant procedure. The atrial lead is the curved one making a U shape in the upper left part of the figure. Permanent pacing with an implantable pacemaker involves transvenous placement of one or more pacing electrodes within a chamber, or chambers, of the heart. The procedure is performed by incision of a suitable vein into which the electrode lead is inserted and passed along the vein, through the valve of the heart, until positioned in the chamber. The procedure is facilitated by fluoroscopy which enables the physician or cardiologist to view the passage of the electrode lead. 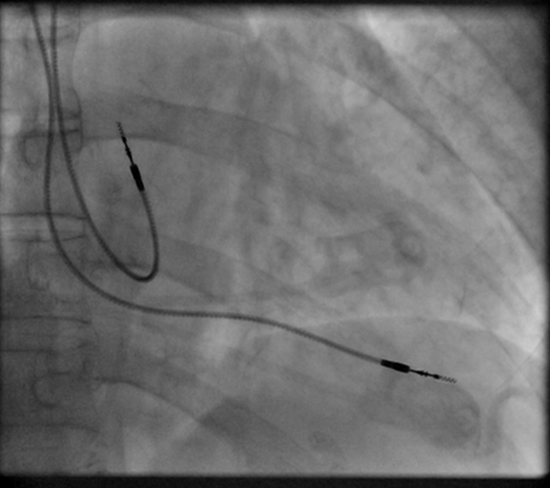 After satisfactory lodgement of the electrode is confirmed, the opposite end of the electrode lead is connected to the pacemaker generator. Single-chamber pacemaker. In this type, only one pacing lead is placed into a chamber of the heart, either the atrium or the ventricle. Dual-chamber pacemaker. Here, wires are placed in two chambers of the heart. One lead paces the atrium and one paces the ventricle. This type more closely resembles the natural pacing of the heart by assisting the heart in coordinating the function between the atria and ventricles. Rate-responsive pacemaker. This pacemaker has sensors that detect changes in the patient’s physical activity and automatically adjust the pacing rate to fulfill the body’s metabolic needs. The pacemaker generator is a hermetically sealed device containing a power source, usually a lithium battery, a sensing amplifier which processes the electrical manifestation of naturally occurring heart beats as sensed by the heart electrodes, the computer logic for the pacemaker and the output circuitry which delivers the pacing impulse to the electrodes. Most commonly, the generator is placed below the subcutaneous fat of the chest wall, above the muscles and bones of the chest. However, the placement may vary on a case by case basis. The outer casing of pacemakers is so designed that it will rarely be rejected by the body’s immune system. It is usually made of titanium, which is inert in the body. You may want to have a say in this decision, or you may simply want to follow your doctor’s recommendation. Either way, this information will help you understand what your choices are so that you can talk to your doctor about them. Don’t get a pacemaker for heart failure. A pacemaker for heart failure is used for cardiac resynchronization therapy (CRT). This type of pacemaker is different from pacemakers used to treat other heart rhythm problems, such as atrial fibrillation and bradycardia. This topic is only about pacemakers for heart failure. You might hear it only called cardiac resynchronization therapy, or CRT. A pacemaker for heart failure, also called cardiac resynchronization therapy or CRT, can help you feel better so you can do your daily activities. It also may help keep you out of the hospital and help you live longer. If you get a pacemaker, you still need to take medicines for heart failure. You’ll also need to follow a healthy lifestyle to help treat heart failure. This may include watching how much fluid you drink, eating healthy foods that are low in salt, and not smoking. Heart experts have guidelines about who might need a pacemaker. Talk to your doctor about the reasons that you might need one. For example, a pacemaker may be a good choice if you have moderate or severe heart failure and your heart’s ventricles don’t pump at the same time. A pacemaker sends electrical pulses to your heart to help it work better. You can’t feel the pulses.